1/8" Cassette Splicing Block - Tracer Technologies Inc. Perfect for any 1/8" tape splicing. 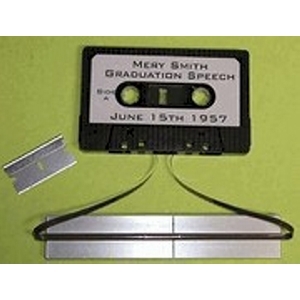 This precision splicing block is made of hardened aircraft strength aluminum, and will last a lifetime if not abused, it is precision machined to hold down the tape while cutting and taping, it has a 45 and a 90 degree cut, and has a self adhesive backing for easy mounting on your work bench or other surface, made in USA.